Kleefeld on Comics: Comic Book Fanthropology Is Go! That's right, True Believers! 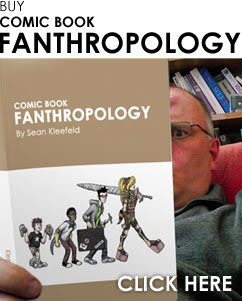 We are now taking orders for my brand new book, Comic Book Fanthropology! Everything's off to the printers and they're ready for you! There are actually three versions available for purchase: paperback, hardcover and digital. The hardcover ended up having to be a little pricier than I would've liked, but that's largely a function of being able to get the book out to other retailers. (It's not available through Amazon just yet, but it's working it's way through various databases.) The content of all three books is identical, so your biggest choice is just what format you'd like to read it in. If you're one the fence about purchasing it, head over to ComicBookFanthropology.com. I'll be serializing the main content of the book beginning on November 27! You can get a taste for the book before you spend any hard-earned cash on it! Because these are print-on-demand books, it does take a little longer to get the books to your mailbox. Please take at look at Lulu's Shipping FAQ for details about how late you can order one (or more!) of these in time for Christmas! This is a great premise for a book. As the Terminator said, "I'll be baaaak."